Aviom's Personal Mixers are the industry standard solution for personal mixing on stage and in the studio worldwide. The A360 Personal Mixer delivers an unparalleled level of control, performance, and fidelity to personal mixing. With more mix channels, powerful features, and the streamlined user interface Aviom Personal Mixers are known for, the A360 helps musicians hear better than ever before. It's compatible with all existing Aviom systems and can be used simultaneously with the A320 and/or A-16II Personal Mixers. The A360 gives musicians a powerful combination of power and simplicity. Even the most demanding musicians can get the mixes they want, with rich sound and outstanding clarity. And it's all in a package that's easy to use, even while you're focused on singing or playing. Under the hood, the A360 has a mix engine with loads of power, so you don't have to make compromises in your mix. Every user can select exactly the sources they want to mix—from up to 64 of them—so drummers can have lots of drum channels and the vocalists can have lots of vocal channels. The free A360 Channel Manager makes it easy to create custom channel maps. Read our Using A360 Channel Manager blog post for more info. Each A360 mix channel can host a mono or stereo source and may be adjusted for volume, stereo placement, tone, and reverb. With more control over each channel, you get a better sounding mix fast. Each mix channel on the A360 can be either stereo or mono—which means you don't have to give up the fidelity of your stereo keyboards, guitar effects, or submixes in order to save channel space on your personal mixer. Every audio source can be heard in full stereo fidelity without taking up additional space on the mixer. This both ensures that every channel sounds its best, improving the fidelity of the overall mix as well, and frees up space for more mix content—without adding more complexity for the musician. The A360's Dual Profile Channel reserves prime real estate for each musician's favorite or most important channel, so you don't have to spend even a beat looking for it. As a bonus, the Dual Profile Channel also offers two sets of mix settings for that channel, instantly accessible through the A or B profile select buttons. In a single touch, you can make your channel louder, brighter, and wetter. The reality for many musicians is that the switch from a wedge to in-ears can be disappointing. The A360 can change all that. Designed from top to bottom with in-ear monitors in mind, the A360 gives musicians the controls they need to make their in-ears sound better than ever. The EQ curves for the master tone controls on the A360 were designed specifically for the sonic characteristics of in-ear monitors. The A360's master Bass, Treble, and Enhance™ tone controls will make your in-ear monitors sound fantastic no matter what kind of music you play. The A360's per-channel reverb control lets you easily restore some of the spaciousness your ears naturally expect. This feature, combined with the A360's powerful Stereo Placement™ controls, gives in-ear monitor users a whole new monitoring experience. With high-resolution panning for mono channels and the independent pan and spread control for stereo channels, every source can be positioned precisely in the mix's stereo field, reducing musicians' sense of isolation and improving the clarity of the entire mix. One-Touch Ambience is an easy way to add ambience to your mix when you want it. Use the built-in ambience mic or set up room mics and assign those channels to the One-Touch Ambience controls on your A360 with the free A360 Channel Manager software. Either way, because the A360 mix engine reserves space for ambience audio, you don't have to sacrifice any other mix sources to add ambience. The A360's Mono Mix Out has a dedicated volume control and XLR connector. You can use it for a powered wedge, but it's even better for adding a tactile transducer (bass shaker). Musicians can once again experience the tactile feedback they may be used to when using a floor wedge or speaker cabinet while still enjoying the clarity and convenience of in-ear monitors. And Aviom makes it easy with the BOOM-1 Tactile Transducer Processor. In systems that include a D800 or D800-Dante A-Net Distributor, Network Mix Back can be used to eliminate analog connections from the A360 to transmitter units for wireless in-ears. A360 Display is an iOS® app that augments the hardware interface with multi-channel views that show each channel in the context of the mix as a whole. Save everything about your mixer—mix settings, channel assignments, names—to a USB thumb drive for safekeeping or transferring to another unit. It's never been easier for multiple ensembles to share personal mixers or for those on tour to be sure their mix settings are preserved from show to show, even if you're using rental gear. Need In-Ears? Get the Bundle! 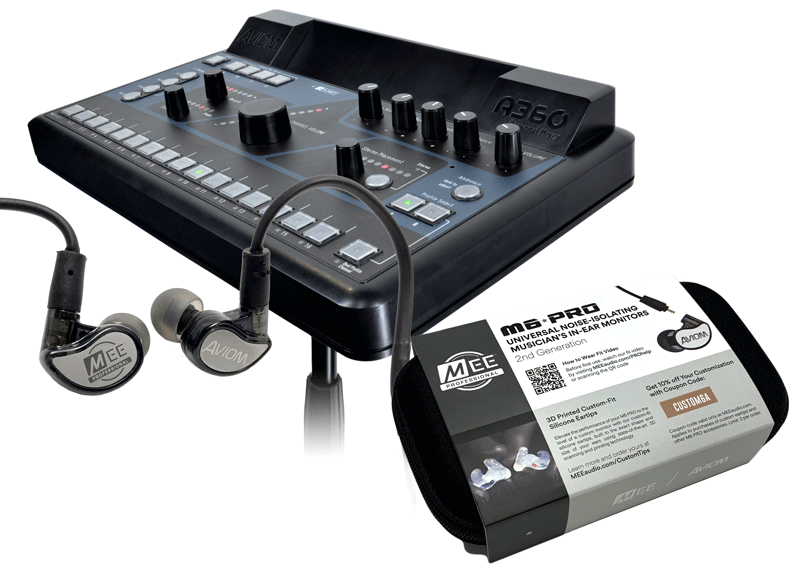 The A360 Personal Mixer is also available in a bundle with a set of MEE Audio M6 Pro IEMs. These great sounding single-driver earbuds feature a detachable, replaceable cord and come with an assortment of flexible ear tips that reduce outside noise and allow you to easily find the most comfortable fit for your ears. Each set also includes custom-engraved metal faceplates and a protective case. Audio is taken from your existing console and distributed to the personal mixers using standard Cat-5e cables. Set-up and configuration is all plug-and-play easy, and you don't need to worry about managed network switches, IP addresses, or latency accumulation.